Nope ... this isn't a post about hunting, nor is it one about fraternal organizations. 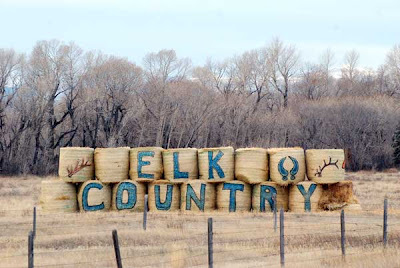 The Elks are the high school football team in Augusta, Montana. High school football is big in Montana, of course ... especially in the smallest towns and schools. Over two-thirds of the state's high schools have fewer than 200 students, though, and nearly half enroll fewer than 100 -- so it can be tough to assemble a football squad. The small schools deal with this by fielding six-man football teams. They play on fields that are only 80 yards long, and it's exciting stuff. 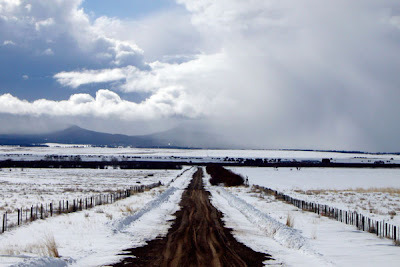 I took this shot about five years ago, looking east across the Gallatin Valley. 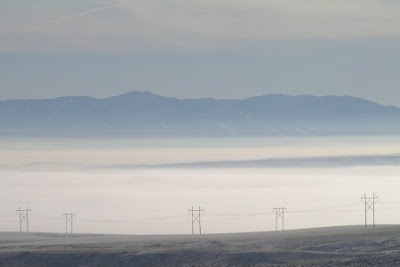 Those are the Bridger Mountains in the distance, and the town of Three Forks is buried in the fog down past the power lines. Montana's real trouble . . . is that her graveyards aren't big enough. 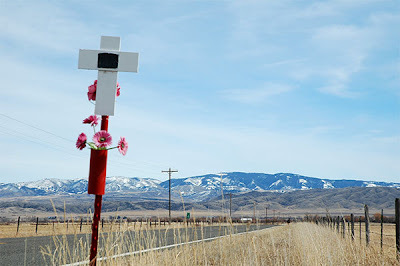 One of the first things people notice when driving in Montana is the number of white crosses that have been placed alongside the roads. The local American Legion has been putting them up for decades, now, each one at the site of a fatal highway accident. You stop noticing most of them after a while, but occasionally one catches your eye ... generally because friends or relatives of the traffic victim have decorated the cross to create a personal memorial. This marker is on a stretch of secondary road between Toston and Radersburg. Someone's added a little container for artificial flowers, and installed a metal plaque at the center of the cross. The plaque contains a person's name, birth and death dates that are sixteen years apart, and the words, "goodbye my son." It broke my heart. 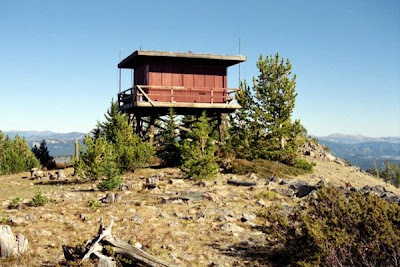 In early twentieth-century Montana, fire prevention was considered a keystone of forest management, and hundreds of fire lookout towers were built in the state. Most were small, box-like structures erected on mountaintops, containing a single, fully-windowed room where someone would live throughout the fire season, looking for wisps of smoke. The idea behind all that always appealed to me, living alone on a mountaintop with a stellar view. Most of the old lookout towers are gone now, of course, done in by aircraft fire surveillance and other factors. A handful of the Montana lookouts are still staffed, though, and a few dozen others still stand, either empty or reused as vacation rentals. Most are in the heavily-forested northwestern part of the state. This is a shot I took in 2002 of the Cinnamon Mountain lookout, located south of Big Sky on the Gallatin National Forest, at the end of a 3-1/2 mile trail. The building has sat empty and shuttered since the 1960s, but the view is still phenomenal as ever. Though I think it's lost most of its allure these days, two or three decades ago every hip college kid in America would have eagerly read Robert Pirsig's Zen and the Art of Motorcycle Maintenance. At least ostensibly, the first part of the book is the story of a westward journey to Montana ... to Bozeman, specifically. "This is a great town," John says, "really great. Surprised there were any like this left. I was looking all over this morning. They've got stockmen's bars, high-top boots, silver-dollar belt buckles, Levis, Stetsons, the whole thing . . . and it's real. It isn't just Chamber of Commerce stuff. . . . In the bar down the block this morning they just started talking to me like I'd lived here all my life." 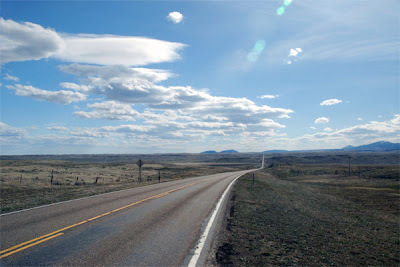 You'll likely see a lot of photos of Montana roads here, most of them long and empty and beneath an endless Big Sky. This is a shot of US 191 between Lewistown and Malta ... definitely a great drive. If you're heading north, though, be sure to fill up with gas and supplies at the Corner Cafe, a little past Roy -- because after that, the next service station or store is 92 miles away! Other than family vacations as a kid, my first Montana experiences were as a summer employee at Lake McDonald Lodge in Glacier Park ... I spent six wonderful seasons working there, and the hotel's annual reopening marked the symbolic beginning of summer for me. Lake McDonald is opening today for the 2009 season, and a big part of me is wishing I were heading back up there to be a bellman yet again. 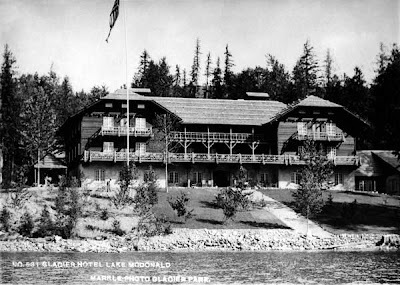 Here's an historic photo of the Lodge, probably from the 1920s or so. The building's as beautiful as ever today ... though much less fun to photograph now that the Park Service has devastated the the hotel grounds with its modern landscaping. My grandfather took his breakfast at the head of a cookhouse table where enamelware pots of coffee and platters of pounded steak were passed. One of the ranch hands asked him about Montana. "It's the best cow country you'd ever see," he said. His eyes shone with the glory of it, or maybe grief. Until that time he'd always said ours was the finest ranch in the West. When people think of Montana ghost towns, it's always the legendary mining camps of the Rockies that come to mind. 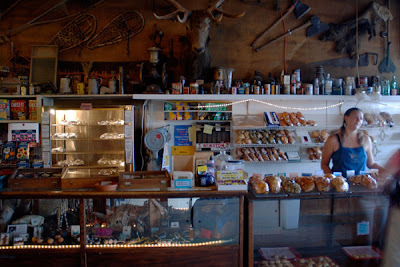 But eastern Montana has them, too, and the prairie towns have stories that are every bit as fascinating and poignant as those up in the mountains. I shot this photo last month at a place called Bowdoin, which is up in Phillips County a little east of Malta. 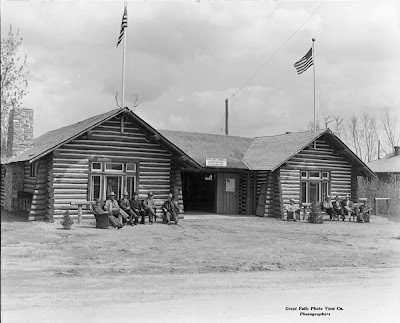 Bodowin was founded in the late 1910s by the Great Northern Railway, which for some reason decided that it needed to build a huge new roundhouse and repair facility at that particular spot. They spent vast amounts of money there, and a town developed nearby to house the workers ... and then a few years later the railroad shut everything down. All that's left is a grain elevator, a single collapsing house, and a sea of foundations out at the old railroad yards. 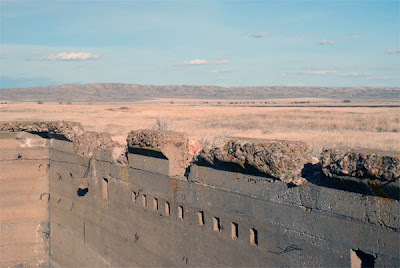 For much of the twentieth century, Montana had three transcontinental railways that traversed the state from east to west. 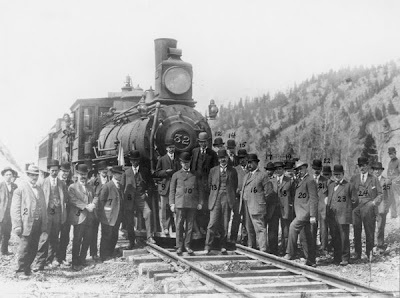 The last to be completed was the Milwaukee Road, which held its Last Spike ceremony exactly 100 years ago today, near the town of Gold Creek. For my money, the Milwaukee was by far the most fascinating of Montana's railroads, with its brightly-colored trains, vintage electric locomotives, handsome depots, and spectacular engineering. Unfortunately, the Milwaukee was also Montana's shortest-lived transcontinental, shutting down most of its Montana trackage in 1980. Today's photo is an historic shot of some of the dignitaries at the 1909 ceremony. For years, a railway-built monument marked the site, and the marker was re-erected in Deer Lodge a few years ago. I'm proud to say that a number of years ago, I had a very small role in the monument's preservation. 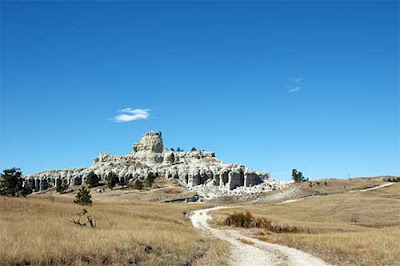 Believe it or not, one of my favorite places in Montana is Carter County, in the far southeastern corner of the state. It has mountains and prairies and forests and badlands country ... and the county seat of Ekalaka is a surprisingly cool little town, with a good museum. But few people ever go there, and it's too bad. This is a shot I took a few years ago of Capitol Rock, one of Carter County's sights. We're nearly within spitting distance of South Dakota here. I have a confession to make today: I'm not really a fan of Butte. While I can appreciate its history, to me the glory of the place is overshadowed by a legacy of social, economic, and environmental ills that are a poor example for us all ... and that Butte will likely never recover from. Nonetheless, I know that a lot of fans of Montana are fairly taken by the place ... so here's a poem for you. This is the opening stanza of "The Idealist," written by a gentleman named Berton Braley probably in the first decade of the twentieth century. And grimy and black and drear? And I've lived here many a year. I'm up in Great Falls this week, doing historic research on a series of old buildings. By far the coolest is a little log structure known locally as the Cowboy Bar. 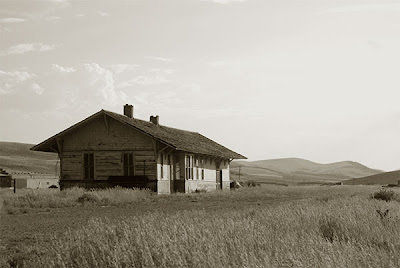 The place was constructed as a public works project right before World War II to be the headquarters of the "Montana Cowboys Association," and to house their museum. And that's what it still is today, although in fine Montana tradition the cowboys added a bar long ago to help pay the bills. And it's extremely cool ... so the next time you're in Great Falls, be sure to stop by. Join the old cowhands for a bottle of Bud Light and check out the display cases filled with dusty Montana relics. You won't regret it. This is an historic photo of the building taken soon after it opened. As you might guess, it looks a little more worn today. 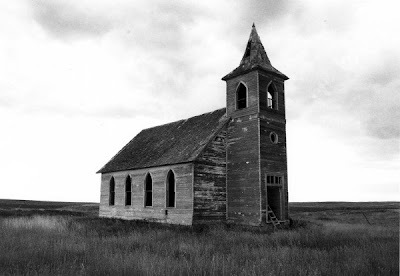 I was extraordinarily fortunate, back in the fall of 1980, to sit in on a class called "Montana and the West" being taught at the University of Montana. This was, of course, the famous Montana history class taught by K. Ross Toole, easily Montana's best-known historian. Many hundreds of UM students took Toole's class every year, and his strident, insightful lectures helped shape a generation of Montana thinking. It was an amazing class, and was largely responsible for solidifying my obsession with Montana's history. Toole only taught the class once more, before dying of cancer in August 1981. The land itself is at once mountainous and flat, hot and cold, beautiful and terrible, and benign and malevolent. And the land has profoundly influenced events. There is little or nothing moderate about the history of Montana. It has ricocheted violently down the corridor of possibilities. What is good in reasonable measure is often bad in full measure, and Montana has been a place of full measure. 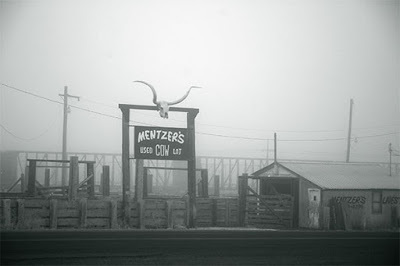 The little stockyard in Drummond, Montana on a foggy morning in early 2007. With a sign like that, who wouldn't want to buy a used cow? This is a photo I took a couple of years ago, of the old Milwaukee Road depot in Ringling. I have a fondness for Ringling ... it's got a great setting, and there's still a good little bar there. And Jimmy Buffett wrote a song about the place! Hard to beat that. Jim Bridger didn't scramble up slopes as many of us do in civilization, he followed his eternity of water beds and was satisfied. Jim Bridger. . . grinding his coffee and slicing his bacon and frying his deer meat in the winter's shadow of the unknown Bitterroot Mountains. What must he have thought back there in the early nineteenth century, old squawman, solitary Jim Bridger? These were my Montana-entry thoughts; it got dark as we went up Lookout Pass in the Bitterroots. High in the snowy grey we looked a mile below to the gulch where a single shack light burned. Two boys in a car almost went off the ridge avoiding our bus, plumping instead into the plowed snowbanks. When the driver went out to shovel them clear, in the silence I opened my window to listen to the secret of the Bitterroots . . . a nameless hush. Down the pass we went to Deborgia, Montana, Frenchtown and Missoula. 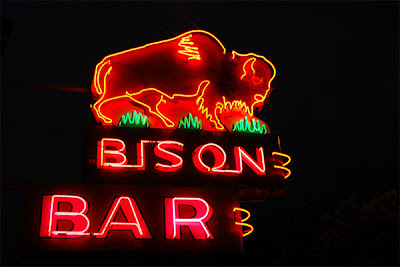 I began to see what Montana was like, at a wilderness way station there were ranchers, loggers and miners in the small bar in back playing cards and slot machines, outside it was the Montana night of bear and moose and wolf, pines, snow, secret rivers, the icy Bitterroots. One small light in the way station, in immensest dark, star-packed. I wondered what native young men thought of their Montana, what they'd thought in 1870, what the old men felt in it, and all the lovely women hidden. I slept en route to great Butte. . . over the Divide, near Anaconda and Pipestone Pass. . . Butte of the rough geographies. Give a month at least to this precious reserve. The time will not be taken from the sum of your life. Instead of shortening, it will indefinitely lengthen it and make you truly immortal. Nevermore will time seem short or long, and cares will never again fall heavily on you, but gently and kindly as gifts from heaven. My favorite part of Gallatin County is the remote Sixteen Mile Canyon area, an hour or so north of Bozeman. 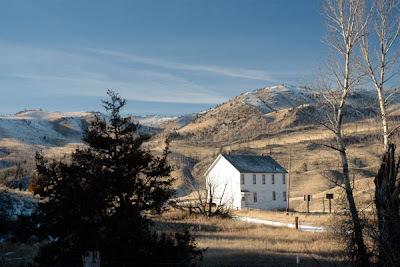 The landscape is beautiful and little-visited, and there's lots of history: the abandoned Milwaukee Road railway line, old cabins and ranches, and the nearly-abandoned townsite of Maudlow. This is a shot I took back in 2007 of the long-disused schoolhouse in Maudlow, one of the county's more iconic historic sites. There is no doubt that Montana has been host to more than its share of literary giants ... more than almost any other state, especially taking into account our minimal population. One of the very best was Joseph Kinsey Howard, whose volume, Montana: High, Wide, and Handsome is easily one of the finest state histories ever written. This sums up what I want in life -- room to swing my arms and to swing my mind. Where is there more opportunity than in Montana for creation of these broad margins, physical and intellectual? Where is there more opportunity to enjoy the elemental values of living, bright sun, and clean air and space? We have room. We can be neighbors without getting in each other's hair. We can be individuals. 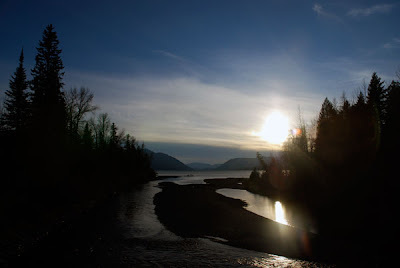 Today's entry is a poem: "Montana Night," by Elliott C. Lincoln, a Montana homesteader. Lincoln arrived in the state in 1908, and homesteaded near Lewistown ... and though he departed for warmer climes in 1917 he remembered Montana fondly, and authored two volumes of poetry about the state. "Montana Night" was published in his 1920 volume, Rhymes of a Homesteader. To Stygian lakes, that spread and multiply. Cool with the dampness of a stream hard by. In one sweet sense of rest; Montana night. I suppose it would have logical to start this blog out with a photo of pretty mountains ... after all, that's the mental image this part of the world generally evokes. And I first moved to Montana because of the mountains. 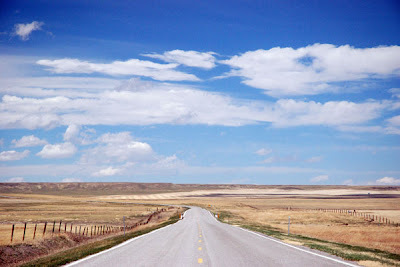 But for me, the state is as much about the prairies -- empty, wide-open roads and endless sky.